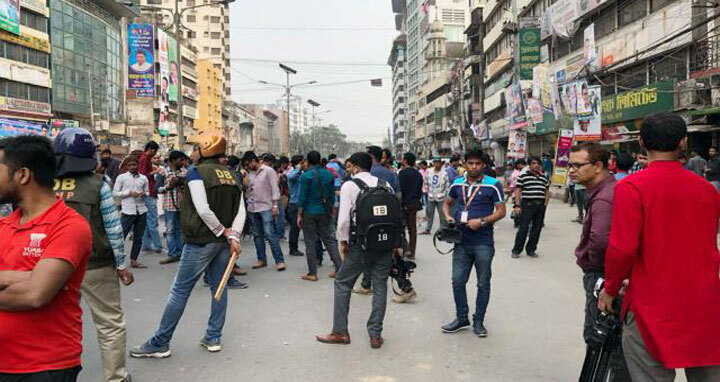 Dhaka, 9 Feb, Abnews: Police on Friday thwarted the rally staged by Bangladesh Nationalist Party (BNP) protesting the verdict awarded to the party’s Chairperson Khaleda Zia in Zia Orphanage Trust graft case. The law enforcers escorted a procession brought out by hundred leaders and activists of BNP from the north gate of Baitul Mukarram National Mosque after Juma prayers on Friday afternoon. Police later obstructed the BNP activists when they reached in front of party’s office at Nayapaltan to hold rally at about 2:00pm, claimed the BNP men. The protestors got dispersed as police charged batons and foiled their rally. Some of the BNP leaders took position at their party office and some left the venue. Witnesses said police also detained some of the activists and took them into the van. On Thursday, a Dhaka court sentenced BNP Chairperson Khaleda Zia to five years of rigorous imprisonment and fines her Tk 2 crore for financial irregularities in the Zia Orphanage Trust.